Aside from my Mountain King, I also recently completed a unit of Warsong Hordeblood Champions. (Photo at the end) I've carved stone in the past for this project, but today I'll demonstrate painting it instead. 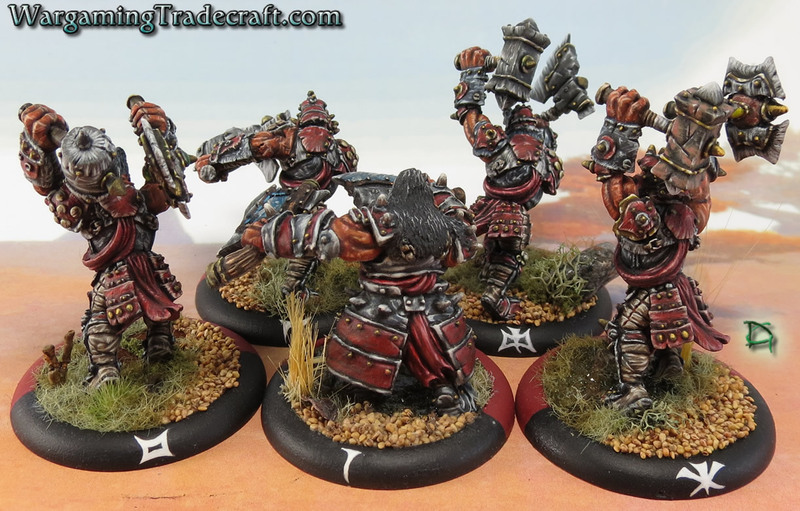 Why might I decide to paint rather than carve? 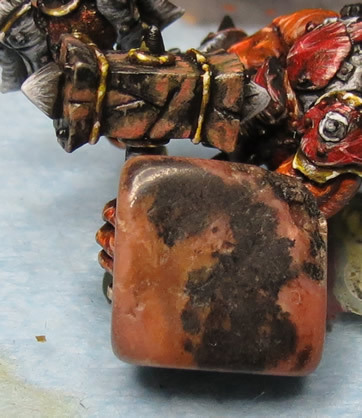 Well, for one, this type of stone is much harder than the turquoise used on Madrak. This makes it more difficult to shape and to drill a hole for pinning. Aesthetically, it's also trickier to have accessories on the stone like the metal trim and spikes. 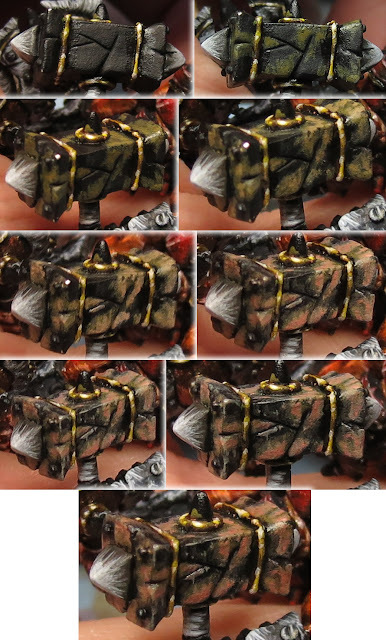 The method for painting this stone was actually pretty straight forward, using only the paints pictured below. I also went with a stone that would blend with the colours of the rest of the figure. I didn't keep the strictest of notes while painting this and mixed some of the colours, but I'm hoping the photos at least give a sense of how the stone came together. In the first 2 rows, I'm using the dark khaki paint in various strengths to create a bottom layer that'll blend into the black stone. 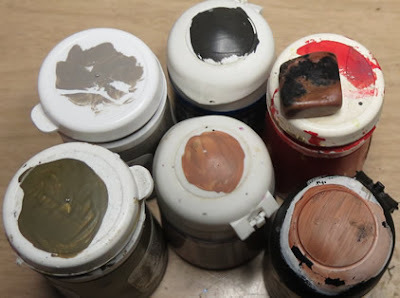 In the third row, I've use flesh tones and a little red to bring these base layers up to the reddish stone I'm aiming for. The fourth row demonstrates using a little of the stone and khaki to blend the black into the khaki of the original layer. I also use grey to highlight edges and add some definition to the weapon. In the final photo, I've added a flesh wash over the whole thing. This ties all the paint together, deeps things and adds a stronger tint to the fleshy areas. In the photo below, you can see the original stone next to the finished hammer again. Pretty sure I did a decent job of nailing this one. In retrospect, I probably could have dulled the black a little and perhaps added a little orange to some of the coloured areas. 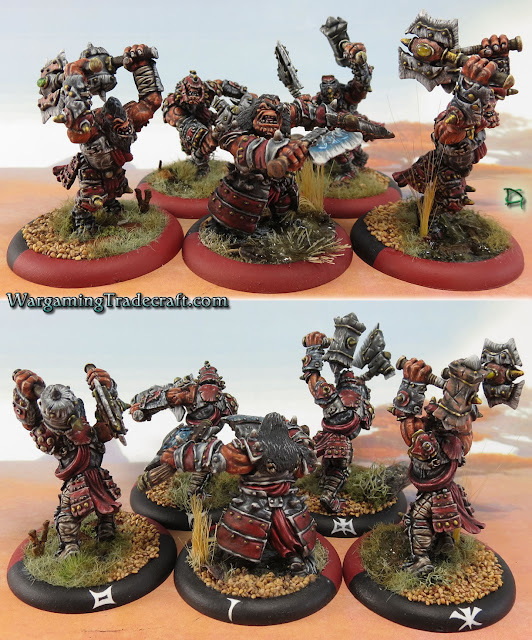 Here's a photo of the whole unit completed. 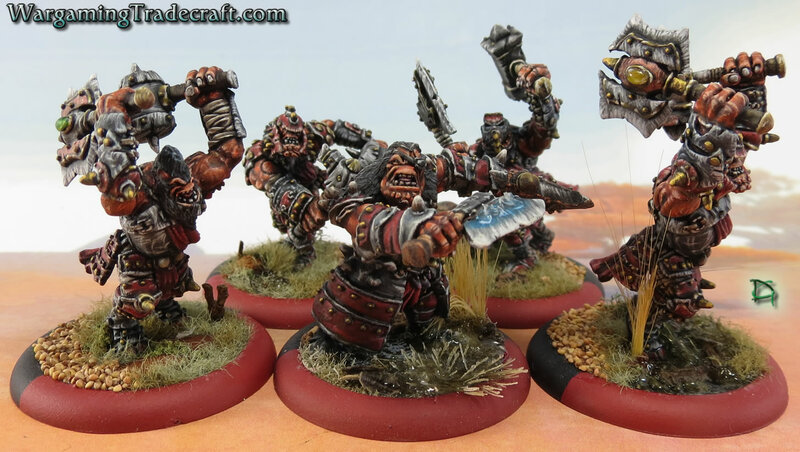 In my next article on these guys, I'll demonstrate painting jewels. I think it came out awesome. There's always room for improvement but I feel you nailed it. Please keep all comments civil and language appropriate for a child-safe environment. RELAUNCH of the Grav StuG Kickstarter. Up to 50.9% discount! How Much Can Casino Games Develop, Anyway? Chaos Marine Chosen Finished and a happy new year! IC Podcast challenge, April. Landspeeder Vengeance. And a Darkshroud. TLA: If It's Not Awesome The First Time; Re-Roll It. Template modified by Dave Garbe.. Powered by Blogger. Content on this website may not be reproduced without written permission from myself, Dave Garbe. Note that I'm not a trained artist - the things discussed on this site are mostly from self teaching and it's entirely possible there are better ways to do them. Miniatures and other products are copyright their respective authors, manufacturers, owners and creators including but not limited to Games Workshop and Privateer Press.